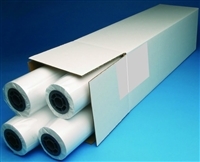 Plotter paper and Designjet wide format supplies for all large format printers and plotters. With over 20 years in the cad and engineering industry we offer premium plotter supplies that are compatible with all HP, canon, KIP, Epson, OCE, Richo and all other wide format printers with 2" and 3" core. Fits all Designjet and other printers with 2" core. Premium Quality Plotter Paper Rolls for Cad and Engineering industry. We offer stand Cad bonds and Color bonds that are compatible with all Designjet and other brand of wide format printers and plotters with 2" and 3" core.